Anybody can make a cup of hot cocoa, but did you know that everyone can also make a delicious rich cup of hot chocolate? The terms Hot Cocoa and Hot Chocolate are often used interchangeably, but technically they are as different as Milk Chocolate and bittersweet chocolate. Hot cocoa is made from cocoa powder, which is chocolate pressed free of all its richness, meaning the fat of cocoa butter. Hot chocolate is made from chocolate bars melted into cream. It is a rich decadent drink. Read more on the Hot Chocolate History page. All chocolate is not created equal. When shopping for your chocolate look at the label to find the percent of cocoa butter the chocolate contains. The cocoa butter is where all the flavor and texture is. The higher the percent of cocoa butter, the better the chocolate. The cooking or baking chocolate is usually found in a block or bar that are then shaved or chopped for use in cooking. Do not use Milk Chocolate as it is not suitable for use in making hot chocolate recipes. Please visit the Chocolate Glossary for more information on types of chocolate. Confectioner’s or Powdered Sugar: Melts fast and leaves no grain. Brown Sugar: Adds butterscotch flavor. Muscovado Sugar: Adds depth to chocolate. Time to Rest: After you make your hot chocolate, take a break and let it cool down before drinking. If you are a patient soul or a good planner, let it rest overnight. When the mixture cools down, the chocolate crystallizes and binds with the other ingredients resulting in a soft silky texture. 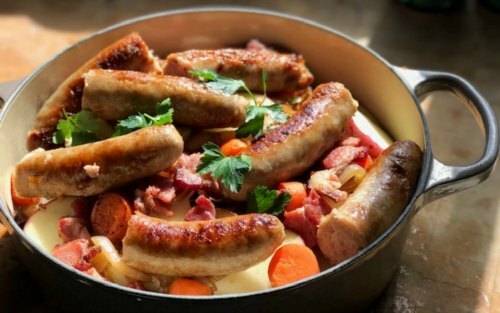 After it cools, reheat in a pan on a stovetop stirring often or in a microwave 30 seconds at a time stirring between each session until it reaches the desired temperature. Frothing: To add texture and fullness mix vigorously with a wire whisk to produce a mass of small bubbles. The more air you can incorporate into the drink the frothier it will be. Tip: To reduce the calorie and fat of my drink, I like to have a nice layer of foam on top of my hot chocolate. I then use a non-fat or 1% milk and forego the whip cream and still enjoy a full texture when sipping my chocolate concoction. Remember you can use an immersion blender or the steamer on an espresso machine to build a foamy bed of sweet bubbles. If you are a traditionalist, try using a Spanish Molinillo, a wooden hand churn used to build the froth (see photo on right). Whipped Cream: Basic Whipped Cream Recipe – Here is your chance to top your hot chocolate with a touch of heaven. A light, sweet fluffy cloud floating on the hot chocolate is the finale to a beautiful cup. Do not settle for processed canned whipped topping. Take a few minutes and blend your own real cream. Real whipped cream is rich and decadent and it’s flavor is very superior to that of its artificial counterparts. There is nothing better than a dollop of whipped cream to add a sweet finish to specialty drinks. Do not reach for that frozen non-dairy topping at your grocery store. Homemade whipped cream is easy-to-make at home using a mixer or manual whisk in just a few minutes. There is nothing more alluring on a cold winter’s day than a savory cup of homemade hot chocolate! One of the season’s greatest pleasures. 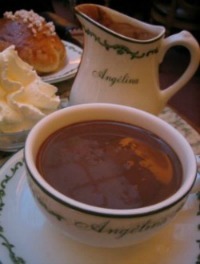 The Angelina Cafe in Paris, open since 1903, serves a thick hot chocolate version in demitasse cups with a tiny dollop of mascarpone and whipped cream. They are famous for making hot chocolate from melted chocolate bars. It is incredibly easy to prepare by mixing chocolate shavings with hot water. You can serve it in small cups or in 17th-century style chocolate pots and demitasse cups such as those sold in gourmet shops. Remove top of double boiler pan from. Whisk in 3 tablespoons hot water. Pour into pitcher or divide among individual 4 mugs. Either stir 3/4 cup hot milk into each mug or serve milk in a separate pitcher. Pass sugar and whipped cream in separate bowls; add to taste. In a medium saucepan over medium heat, combine cream or milk, vanilla bean and cinnamon stick until bubbles appear around the edge. Reduce heat to low; add chocolate and sugar or honey; whisk occasionally until chocolate is melted and sugar dissolves. Turn off heat; remove vanilla bean and cinnamon stick. Add chile-infused water, a little at a time, tasting to make sure the flavor is not too strong. If chocolate is too thick, thin with a little more milk. Italy is famous for their Cioccolato Caldo, especially during the fall and winter months. This hot chocolate is sometimes served so thick (like a pudding), that you need a spoon to actually eat it! This recipe does not make it that thick. The luxurious richness comes from using top-quality chocolate. In a small saucepan over low heat, add the cocoa powder, sugar, and 2 tablespoons of the milk. Heat until the sugar melts and no lumps remain, stirring well. Bring to a low boil, stirring constantly; add the remaining milk. Turn off the heat, add the chopped chocolate, stirring until smooth. Pour into serving cups and enjoy! Enjoy a warming cup of Hungarian Hot Chocolate with hints of cloves, paprika and white pepper. The taste is uniquely delicious and satisfying. In a saucepan over medium-low heat, combine milk, paprika, pepper, and cloves. Heat, stirring constantly, until almost boiling. Reduce heat to low and remove the cloves. Add the chocolate and stir in to the milk mixture until the chocolate is melted. Whisk briskly to build a rich froth and pour into warm mugs and serve. Also check out Ellen Easton’s delicious Hot Chocolate recipe that she serves for afternoon tea. In central and southern Mexico, people commonly drink chocolate twice a day year-round. Having a layer of foam on hot chocolate is as important today in Mexico as it was in ancient times. Mexicans believe the spirit of the drink is in the foam. The chocolate is whipped to a froth with a carved wooden utensil called a Molinillo and served in mugs. Beat 2 eggs in a mixing bowl. Stir in one cup of the hot mixture into the eggs, then return this mixture to the saucepan. Cook 2 to 3 minutes more over low heat, still stirring. Remove from heat. Add vanilla. Beat with a Molinillo or a rotary beater until it is very frothy. Pour into mugs, garnish with cinnamon sticks, and serve. Makes about 6 (8-ounce) servings. Enjoy a cup of hot chocolate with the hint of orange and the additional treat of Grand Marnier liquor. A decadent cup of chocolate! In a sauce pan over medium-low heat, combine milk, zest, cayenne, nutmeg and clove. Heat until almost boiling, stirring constantly. Reduce heat to low and remove the cloves. Add the chocolate and stir into the milk mixture until the chocolate is melted. Whisk briskly to build a rich froth and pour into warm mugs and serve. Garnish with a dollop of whipped cream. Check out this fantastic Fireball Mexican Hot Chocolate Recipe that has alcohol in it. Both my daughters got together to have a hot chocolate cooking day and came up with some wonderful flavor combinations. For this recipe, they even flavored the whip cream with a little bit of the Fireball Whisky. This turned out so good, they were ready to finish off the entire bowl of Whipped Cream! They garnished the top with some cinnamon and crushed red hot sprinkles. Melting chocolate is not the same as Tempering Chocolate. There is a difference between hot cocoa and hot chocolate. The terms are often used interchangeably, but technically they are as different as white chocolate and bittersweet chocolate. Need a quick substitution for chocolate? Here are some chocolate substitutions, but remember not always do they work as well as the original recipe ingredient.